Bob was employed as a banker for Chase Bank in New York City and as a vice-president, senior financial advisor for Merrill Lynch, retiring in 1998 after 40 years in the financial industry. Surviving are his wife, Claire; daughters, Maureen McLaughlin, Susan Regan, and Ellen Eustace; stepdaughter, Crystal Heart; son, Robert and stepson, Glenn Reisner; brother, Maurice; nine grandchildren and one great-grandson. 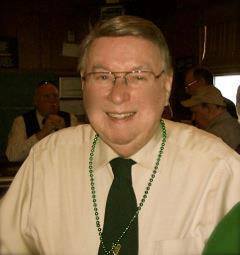 Bob was his Division’s Chairman of Standing Committee and was in the middle of his 7th year serving on the Executive Board of the AOH, Saint Patrick Division 1, Somerset County, NJ. Bob led the AOH Choir at the Division’s Annual Mass for numerous years, and also organized the membership’s work shifts at our picnics. Bob was also the Division’s Freedom-For-All-Ireland Chairman and led the annual FFAI Appeal with great success. His work for our Division, his friendship, and his presence will be missed.